Once again Google puts out a doodle worth mentioning. 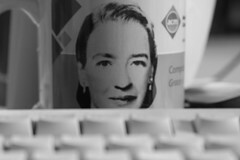 This time they celebrate the 107th birthday anniversary of computer scientist Grace Hopper. In case you do not know who Hopper is, well, let me smile say that she is the amazon woman behind COBOL (Common Business Oriented Language), which is still very much used today. Grace Hopper was born in New York in 1906 and studied Mathematics and Physics (of course) at Vassar College where she graduated in 1928. She then obtained a master’s degree at Yale in 1930 and a PhD in 1934. Hopper joined the US Navy reserve during World War two and she was assigned to the Bureau of Ordinance Computation Project at Harvard University where she was only the third person to program the Harvard Mark I computer. She continued to work at Harvard until 1949 when she joined the Eckert-Mauchly Computer Corporation as a senior programmer. She helped to develop the UNIVAC I, which was the second commercial computer produced in the US. In the 1950s Hopper created the first ever compiler, known as the A compiler and the first version was called the A-O. Hopper continued to serve in the navy until 1986 when she was the oldest commissioned officer on active duty in the United States Navy. She died in Arlington, Virginia in 1992 at the age of 85.